When I think back to what started my vintage postage obsession, I default to crediting Pinterest (where all fabulous ideas come from); however, my mother reminded me a few months ago that she has been sending me envelopes covered in [strange] combinations of vintage stamps for years. So perhaps now is the right time to credit my mom for inspiring my philatelic obsession. As I got my Mother’s Day card ready to send out, I veered towards her vintage stamp style - stamps chosen more for humor than for good looks. I covered the envelope (which was obscenely over-posted) in vintage stamps that ranged from potentially offensive due to changing social norms and vocabulary over the past 50 years, to downright strange and generally unappealing. Does it tell a story? Yes, but probably not one that most people would appreciate, or understand, but, I know that when she receives it she’ll get a kick of out it, and that’s what’s really important. The lesson here is: Know your audience. This is what I truly love about curating vintage stamps - you have the ability to command attention, tell a story, get a second, third and fourth look, and remind people that what they just received in the mail took time, effort, and love to put together. 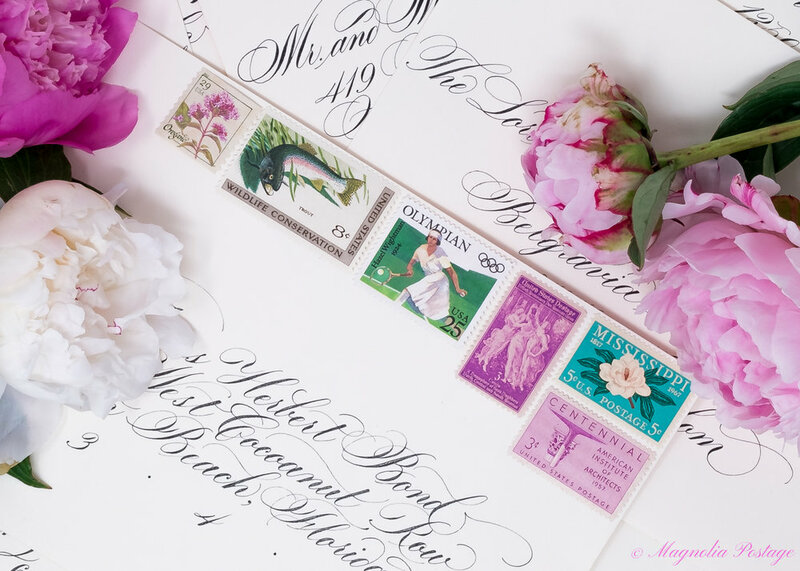 Whether it's vintage stamps for wedding invitations, holiday cards, birth announcements, or just a cute note to say hello, don't we all want that second, third and fourth look? If my Mother’s Day audience was different, my card might have looked more like one of these, and perhaps would have been accompanied by peonies, my mom’s favorite flower. Wishing all of you a very Happy Mother's Day - we're so excited to be sharing with you on a fun new platform. Beautiful calligraphy in the images is by Suzanne Cunningham, and hints of a beautiful paper suite by Ledgewood Fine Stationery.